But not glorious, lush curls – more of an uncontrollable mane. Fine, disobedient spirals that can never be brushed. In fact, my hair devours and dismantles a brush. And even worse, my temperamental locks take forever to grow. If the haircut is horrid – unfortunately I’m stuck with it. And I’ve had so many bad haircuts that admittedly I leave it for months before having to reluctantly try another hairdresser. Typically the result is the same – an empty wallet and hair fit for a hat.So this time I did my research* – and found Elaine at Alan Edwards Salon in the Merchant City. Elaine has curly hair. And so I am hopeful. Still, I arrive at the salon nervous. It’s bright, boisterous with colourful bottles of product everywhere – a typical salon. And then I speak to Elaine. And it’s different. She doesn’t spend the first 15 minutes asking me if I’ve ever straightened my hair or insisting that she force it into submission. Instead she asks me questions about my hair, detailed questions. She assesses and identifies things about my hair. She banishes the photos that I’ve brought with me of women with hair that is curly – but nothing like mine. And after we discuss my hair at length, it’s washed and I’m fed a stream of crucial information about what’s being put in my hair and why. And then Elaine gets into the zone. Initially she moves my hair this way and that with Zen like communication between her and each follicle. I don’t interrupt. And then the magic truly begins – she cuts my hair twice – once wet, once dry – because as she logically points out – hair is so different when wet and dry. It makes perfect sense, even though I’ve never experienced this before. She cuts it, she twists spirals through it, adds magical product and coaxes it all into profection with a diffuser. And my hair looks amazing. And then she cuts some more – including that annoying straight bit at the back. And it looks even more amazing. 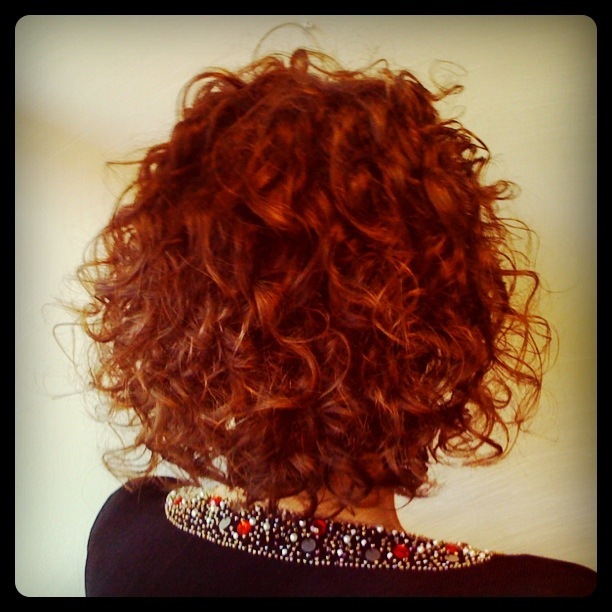 My hair is transformed – suddently it’s thick, defined and my face had changed shape. I have cheekbones again. I am youthful. According to my eldest son – I am “more 21st century”. Goodbye 80’s throwback horror haircuts. Goodbye fear. Goodbye hats. I have found my hairdresser, I am woman hear me roar (without the unruly mane of course). *Thanks to all of your who shared your experiences, sympathy and suggestions. Hopefully this sets you on the road to wonderful curls too!